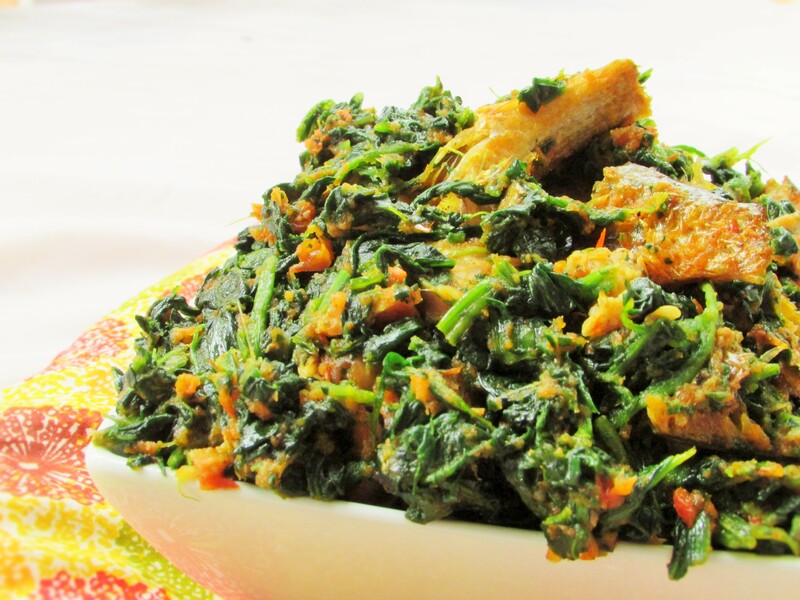 Efo riro is a rich Nigerian vegetable soup mainly cooked by the Yoruba speaking people of Nigeria. 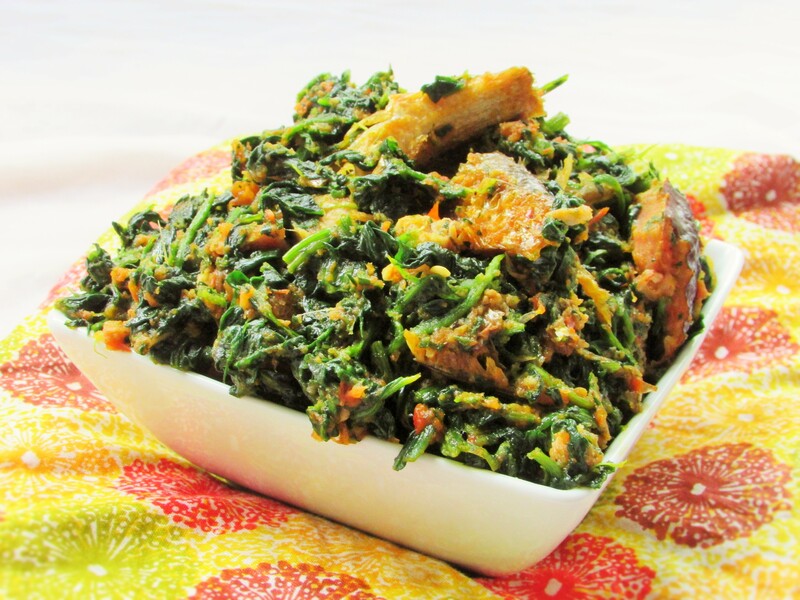 Efo riro can be classified as one of the easiest Nigerian soup or stew dishes. It can be made with or without oil. It can also be made with either Palm or Vegetable oil, but traditionally with palm oil. I love this dish because it is fairly healthy. You may use oil if you want and only add it towards the end of your cooking. You may also use this recipe for any meat stew with any side and without the vegetables. I loved the idea of cooking the meat stock with the tomatoes, no flavor was lost and I really did not need to use anymore seasonings. Some people do use Iru i.e. Locust beans, but it is not. On it’s own, this was just a blissful discovery. In a soup pot, season the meats with the other half of the onion, crushed garlic, ginger, knorr, 1 tbsp. of grinded pepper and salt to taste. boil it in it's own juices until almost dry; then pour in some water to the level of the meat and check for seasonings. If using smoked turkey, wash and bring to boil in a separate pot. Once it has softened, drain and remove the salty skin and set aside. Once the meat is almost soft, add the boiled, smoked turkey into it; along with the blended tomato and pepper. Cover the pot slightly, reduce the heat and let it cook. There should be a sweet smell wafting through your kitchen. After about 15 minutes, add the crayfish, iru and dry fish. At this point, if using any oil, it would be okay to add it. Taste for seasonings, and cook until the tomato has reduced. If you used any oil, the oil should float to the top; if not the tomato would just be slightly thick with no sour or acidic taste to it. Add the spinach and the other tbsp. of the dry grinded pepper. Stir and cook for another 5 minutes to prevent the Spinach from over cooking. This entry was posted in Eating Healthy, Healthy Nigerian Dishes, main dishes, main meals, Nigerian Casseroles, Nigerian sauces, Nigerian soups, Nigerian Stew, Side dishes, Soups, stew, Stews, Uncategorized, Vegetable soup and tagged Efo, Efo recipe, Efo riro, Efo riro recipe, Nigerian Vegetable soup, Nigerian vegetable soup recipe, oil less efo riro recipe, oiless Efo riro, oiless Efo riro recipe, spinach stew recipe, Vegetable soup recipe.